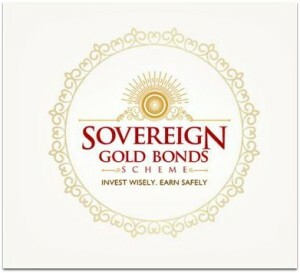 FY 2018-19 Series-I Sovereign Gold Bonds Issue | Should you invest? The Reserve Bank of India, in consultation with the Government of India, has decided to launch latest Sovereign Gold Bonds Issue Series-I (FY 2018-19). Applications for the bonds will be accepted from 16th April, 2018 to 20th April, 2018. The Bonds will be issued on 4th May, 2018. This is the first tranche of the Financial Year 2018 – 2019. The Gold Bonds scheme was launched in November 2015. Applications for the latest ‘Sovereign Gold Bonds Scheme’ will be accepted from April 16, 2018 through banks, Stock Holding Corporation of India Limited (SHCIL), designated post office branches and stock exchanges (BSE & NSE). Latest Issue Subscription dates : 16th Apr, 2018 to 20th Apr, 2018. A discount of Rs 50 per gram from the issue price is offered to those investors who invest through online mode. For such investors, the issue price of Gold Bond will be Rs 3,064 per gram of gold. The Bond’s price of the last SGB issue was around Rs 2,850 (Dec, 2017). Duration of Bonds : The tenor (tenure) of the Bond will be for a period of 8 years with an exit option from 5th year onwards. Gold bonds shall be repayable on the expiration of eight years from the date of the issue and premature redemption is permitted after 5th, 6th and 7th years from the date of issue of SGB, to be exercised on the interest payment dates. Maximum allowed investment : The maximum amount subscribed by an entity or an individual investor will not be more than 4 kg per financial year (April-March). A self-declaration to this effect will be obtained. In case of joint holding, the investment limit of 4 kg will be applied to the first applicant only. The annual ceiling will include bonds subscribed under different tranches during initial issuance by Government and those purchase from the Secondary Market. In case of joint holding, the investment limit of 4 KG will be applied to the first applicant only. Nomination Facility : Please note that nomination facility is available to a Sole Holder or all the joint holders (investors) of an SGB. A sole holder or all the joint holders may nominate maximum of two nominees to the rights of the bonds. The Nomination facility is not available in case the investment is on behalf of minor. The nomination can be altered by registering a fresh nomination. 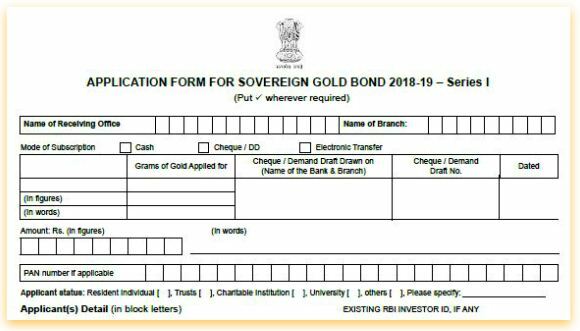 Click on the below image to download Gold Bonds Application form 2018-19 Series -I. To know the list of banks where you can buy SGBs, click here..
To know the list of Post office branches that are offering these bonds, click here..
Gold bonds will be exempted from capital gains (LTCG) tax at the time of redemption. In case, you hold the bonds till the maturity date and if you make any long term capital gains when redeeming your gold bonds, there will not be any capital gain taxes on the profit you make. If there are uncertainties across the globe, trade-wars between the Nations and if the geo-political risks are high (for example : conflict between North Korea and the USA, tensions in Middle-East etc.,) generally Gold prices tend to increase. Investors tend to take refuge in assets like Gold. But, do note that interest rate hikes by the USA is negative to Gold, but looks like that this has already been factored in international Gold prices. I have got a msg from epfo office on 14 apr 18 the pf claim is setteled and amount will be credited in 3-4 working days.still i have not received any amount..how many days take it? Dear Atul .. It takes 2 to 5 business days to get the credit (from claim settlement date). Last Sat & sun were bank holidays. At the END, Means after 8 years, if I want can I get Physical Gold from these bonds? I believe that on maturity of bonds, the investors will get the rupee value amount and not physical gold. You may buy physical gold using that amount!